“Tea, Earl Grey. Hot.” As if. After a few years of my doctor saying, “You know, you should probably get a mammogram, just to have a baseline,” now was apparently the time to have one*. So two days after going in for my annual exam, there I was in a spa-like changing room getting ready for my first mammogram. I’d heard horror stories (just the description of squishing did not sound like the Most Fun Ever), so I expected the worst: a drawn-out embarrassing process** that would involve discomfort, pain, and another Awful Medical Experience***. It was so very far from that. The technician was upbeat and pleasant, and more to the point ON TIME****., so not drawn out. No embarrassment, even with a little cotton gown-vest (I appreciate concerns about modesty, but by the point you have someone handling your body parts and positioning them ‘just so,’ embarrassment no longer exists). And no pain! Sure, it’s not the most comfortable of procedures*****, but it’s over quickly. Hurrah! My only moment of “Arrrooo?”****** was seeing two aerosol cans of deodorant in the changing room. I hadn’t seen aerosol deodorant in a long time, and yet there they were. It took a few moments to realize, “Oh, that would be the most sanitary way to provide deodorant” since you’re not supposed to wear any for the scan. It also had me wonder if mammography in its own strange way is keeping one aspect of the deodorant industry afloat. 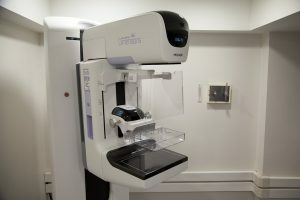 tldr: I got my first mammogram, and it didn’t kill me. *Funny, the same thing happened with the gum graft. Not sure what to make of this. **I wasn’t sure it could top either of my EKGs, but hey, anything is possible. ***Admittedly, these experiences make great story fodder. ****I’m still unclear on why medical appointments (even at the earliest, first thing in the morning time slots) seem to still require the doctor to take twenty-plus minutes after the scheduled appointment time to show up. Is this just a standard modus operandi? Do they set physician’s clocks behind by twenty minutes? Or are the docs just trying to be kind, figuring that they don’t want to interrupt you while you’re reading that fabulous article from last month’s People magazine about Pippa Middleton’s wedding? *****Take any solid object and try to squish it flat, then hold it there at 20 psi for 30 seconds. Good times! ******Picture a dog looking at something that looks familiar, but just knows that something is not right: head cocked to the side, ears at attention. Yeah, that was me. Try Infectious Mono & Appendicitis on an isle in the North Atlantic, the doctor said they would not use the operating room–it had not been opened in 20 plus years. So for me, they called a gooney bird, two other fellows appreciated the quick ride to Goose Bay. Yep they tell you 20 minutes early for check-in and to allow for longer than anticipated appointments.